The video was posted on YouTube and it offers, to say the least, a magnificent spectacle. A production company employed by the BBC hid dozens of cameras in fake eggs amidst a colony of penguins. One of the dummy eggs caught the attention of a Southern Caracara, a very rare raptor. 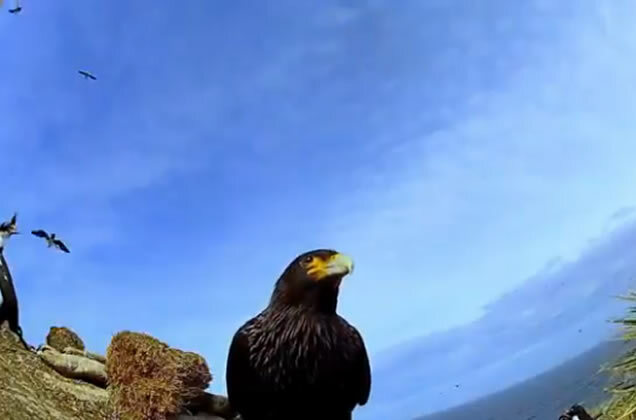 Once the fake egg is in safely in its talons, the bird takes off, filming an overview of the area, offering incredible (and approximately framed) aerial views. Incidentally, ornithologists consider the caracara “one of the most intelligent birds of prey” and “a bold, opportunistic raptor”.